Can I see my child from the waiting area? You can see all of the gymnasts from our waiting area. Our waiting area is well lit, great for bringing your favorite book while you wait. How long do I have to do my Makeups! What if I need to remove my child for a while? We request that you give us a two-week written notice if possible. The registration fee you paid is good for a year. When you choose to sign them up again during that year you won’t have to pay the registration fee until the annual due date. Make-up classes can not be done if you are not currently enrolled in a class. Your tuition does 2 things. It pays for the classes and holds your spot. If you do miss a class your child will not be taken off the role and can come back to the same class. Make up classes are offered in other classes with openings. We encourage you to come to every class. Our policy has always been to allow one make-up a month.As long as our class numbers will allow we will work with you, if you miss more.We have found that if you miss more it is very difficult for you to get them in. You must be an active student to do make-ups.Keep this in mind as summer or fall draws near. You will need to do your make-up classes before you drop for a season. Call the front desk to check on availability in other classes. Class tuition is based on four classes per month. Months with five classes are used as make ups. For example if we are closed on a Thursday for Thanksgiving and there are 5 Thursdays in November you will not need a makeup class. If there are 5 Thursdays in December and no closings that will serve as a makeup. Students should wear clothing that does not have buttons or zippers. 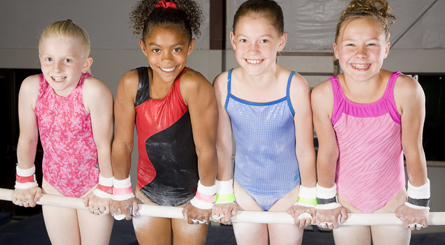 Girls are encouraged to wear a leotard (however, it is not mandatory). Hair pulled back away from the face, and no jewelry. Boys should wear gym shorts and t-shirts tucked in. All gymnastics students should be bare-footed in class. Tumbling students should wear gym shorts and t-shirts. It is at the student’s discretion to wear tennis shoes or not. 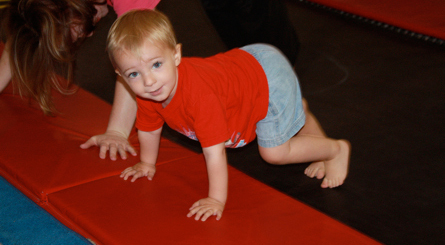 If you are participating in tumbling classes to enhance your cheerleading skills you may wish to leave your shoes on. 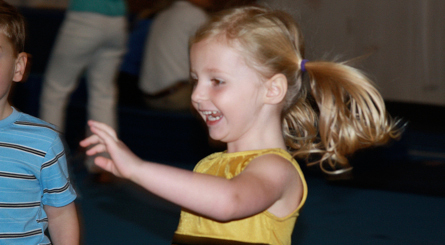 What should I do while my child takes the class? We have a waiting area for your family. You can see your child’s class from the waiting area. How can I help my child prepare for class? It is always a good idea to have your students use the restroom prior to class starting. You shouldn’t get here to early or have them eat to much before the class.